Justin Theroux has spoken for the first time about his split from wife Jennifer Aniston, saying that although it was a "gentle" separation, it was "heartbreaking". The star of The Leftovers and Hollywood actress announced that they were parting ways after over two years of marriage and almost seven years together in February. In an interview with The New York Times, the 47-year-old actor has broken his silence about their divorce, and said they went their separate ways without any hostility. 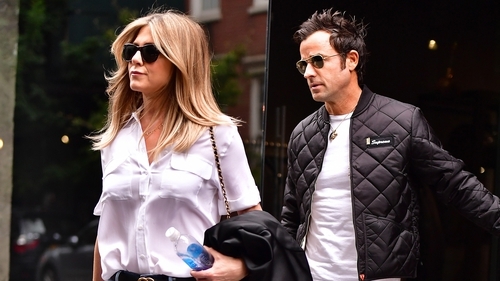 Justin Theroux says split from Jennifer Aniston was "gentle"
"The good news is that was probably the most - I’m choosing my words really carefully - it was kind of the most gentle separation, in that there was no animosity," he said. "In a weird way, just sort of navigating the inevitable perception of it is the exhausting part." "Again, neither one of us is dead, neither one of us is looking to throw hatchets at each other. It’s more like, it’s amicable. It’s boring, but, you know, we respected each other enough that it was as painless as it could be." However the actor and writer admitted that the split brought them both a lot of sadness. "It was heartbreaking, only in the sense that the friendship would not be the same, as far as just the day to day," he said. "But the friendship is shifting and changing, you know, so that part is something that we’re both very proud of." Theroux also tried to shed light on the curious nature of marriages in Hollywood, saying that because acting is "kind of a carny lifestyle", that the split "doesn't have that seismic shift of an ordinary couple, where everything is, like, you have to tear a baby in half." The actor, who can currently be seen in the Netflix series Maniac alongside Emma Stone and Jonah Hill, added that navigating the media post-split has been one of the biggest challenges. "How do you combat gossip and rumour? And it's just on crack and steroids now", he said. When asked if he is currently dating anyone, Theroux replied: "Is this the part where I coyly raise an eyebrow and not answer the question?" Aniston also talked about the challenges she has faced in the press and the "fair share" of sexism she has been subjected to in the media in August in her first in-depth interview since announcing her split from Theroux. "When a couple breaks up in Hollywood, it's the woman who is scorned. The woman is left sad and alone. She's the failure. F that", she said. "When was the last time you read about a divorced, childless man referred to as a spinster?" She also blasted the media's portrayal of her as "sad and heartbroken". "The misconceptions are 'Jen can't keep a man,' and 'Jen refuses to have a baby because she's selfish and committed to her career.' Or that I'm sad and heartbroken. First, with all due respect, I'm not heartbroken. And second, those are reckless assumptions", she said. Aniston and Theroux announced their split with a joint statement in February which read: "In an effort to reduce any further speculation, we have decided to announce our separation. "This decision was mutual and lovingly made at the end of last year. We are two best friends who have decided to part ways as a couple, but look forward to continuing our cherished friendship." The couple began dating in 2011 and married in a secret ceremony at their Los Angeles home in 2015 that took many of the couple's guests, as well as the media, by surprise. Aniston was previously married to actor Brad Pitt from 2000 - 2005. Pitt left Aniston for actress Angelina Jolie, however they split in 2016.